State Farm asks, Is Your Trunk Roadside Emergency Ready? Murfreesboro, TN – Severe winter weather can touch many areas that wouldn’t normally have to deal with it. Historically bad weather means the potential to be stranded on the road rises exponentially. Nearly all drivers could improve what is in their trunk to be better prepared for roadside emergencies. A survey by State Farm and KRC Research shows two-thirds of drivers (67 percent) had some sort of “junk” in their trunk ranging from car detailing equipment to toys and used food or drink containers. Additionally, drivers shared a variety of strange “junk” items in their trunk including an old gorilla costume to an inflatable sheep to a wedding dress. Getting rid of the “junk” (non-emergency supplies) and adding the right supplies will help people deal with the unexpected and get back on the road. When it comes to being prepared for roadside emergencies, men are more likely than women to have at least one of the essential supplies in their trunk according to the survey. Essentials include jumper cables (64 percent of men vs. 53 percent of women), a flashlight (62 percent of men vs. 48 percent of women), and a first aid kit (47 percent of men vs. 40 percent of women). Men are also more likely than females (81 percent to 53 percent, respectively) to check their vehicle’s emergency supplies. The survey also revealed that parents (77 percent), younger (79 percent) and middle aged (73 percent) drivers were significantly more likely to have “junk” in their trunk, than non-parents (62 percent) and older drivers (58 percent), respectively. While nearly all drivers (96 percent) had at least one emergency item in their vehicle, such as a spare tire or jumper cables, a mere five percent carried all the emergency roadside equipment, including: jumper cables, spare tire, hazard triangle/road flares, flashlight, first aid kid, windshield scraper, water, non-perishable food and a blanket. Nearly four in 10 (38 percent) drivers with emergency supplies say they check that their supplies are working at least twice a year or more (the recommended frequency). Thirty-one percent of drivers say they only check once a year and 32 percent say they have never checked at all. 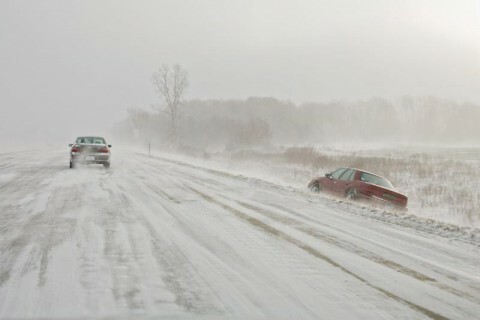 State Farm encourages responsible driving every day of the year, and especially during cold weather months when inclement weather is more common. If driving conditions turn treacherous and leave you stranded, these emergency roadside items can help you stay safe until help arrives. For additional information and emergency roadside tips, visit http://st8.fm/I4W. The study was an online survey designed and conducted by KRC Research on behalf of State Farm from October 25th to November 3rd, 2013. In all, 1,000 drivers among a demographically representative U.S. sample of adults 18 years of age and older were surveyed. All respondents were required to have a valid U.S. driver’s license to participate in the survey. This online survey is not based on a probability sample and therefore no estimate of theoretical sampling error can be calculated. State Farm and its affiliates are the largest provider of car insurance in the U.S. and is a leading insurer in Canada. In addition to providing auto insurance quotes, their 18,000 agents and more than 65,000 employees serve 81 million policies and accounts – more than 79 million auto, home, life and health policies in the United States and Canada, and nearly 2 million bank accounts. Commercial auto insurance, along with coverage for renters, business owners, boats and motorcycles, is also available. State Farm Mutual Automobile Insurance Company is the parent of the State Farm family of companies. State Farm is ranked No. 44 on the Fortune 500 list of largest companies. For more information, please visit http://www.statefarm.com or in Canada http://www.statefarm.ca. KRC Research is a full-service research firm that specializes in the kind of research needed for effective communications—communications that reach, engage and persuade. A unit of the Interpublic Group of Companies (NYSE: IPG), KRC Research offers the quality and custom service of a small firm along with the reach of a global organization. For over 30 years, KRC Research has worked on behalf of corporations, governments, not-for-profits and the communications firms that represent them. Staffed with market research professionals from the worlds of political campaigns, consumer marketing, journalism and academia, we are flexible, practical, creative, knowledgeable and fast, combining sophisticated research tools with real-world communications experience.